An unaltered photocopy of your DD-214, WD AGO, NAVPERS, NG or other military issued document clearly displaying your award of the Air Force Longevity Award. 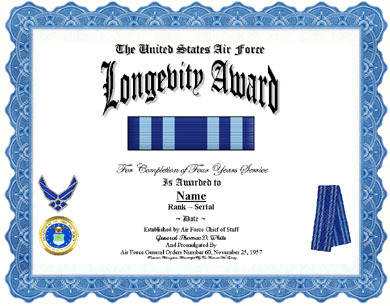 The Air Force Longevity Service Ribbon was established by Air Force Chief of Staff General Thomas D. White and promulgated by Air Force General Orders Number 60, November 25, 1957. This ribbon has been made retroactive without restriction. The Air Force Longevity Service Ribbon is worn after the Air Force Overseas Service Ribbon (Long Tour) and before the Military Training Instructor Ribbon. The Air Force Longevity Service Ribbon may not be worn on the Army, Navy, or Coast Guard uniforms. The ribbon is ultramarine blue divided by four equal stripes of turquoise. Bronze oak-leaf clusters are worn on the ribbon to indicate subsequent awards of the Air Force Longevity Service Award.